I was recently looking through the music listings for my area and I came across Louise Jordan young singer who is playing Bridgwater Arts Centre on the 9.2.13. I was intrigued by her selection of music, the interesting way in which she has blended music and literature, and her own finely wrought songs. I checked out emusic, where I have had a subscription since Turing was a lad and downloaded a couple of her albums. I was impressed. She had covered one of my favourite traditional songs William Taylor, a tale of a jilted bride left at the altar, sea battles and retribution. They don’t write them like that anymore. But I digress. How did your experience of working in education inform your perspective of writing and playing music? Working with a classroom full of children is great for developing communication skills and learning audience awareness –thirty plus children aged 11-16yrs can be a fairly unforgiving audience when you don’t quite pitch it right! Understanding what makes people tick is crucial to making my song writing relevant and as a teacher /mentor /youth worker I have taken a great interest in how we question and challenge what’s in front of us: children are mostly too honest to hide their true feelings. Everything. Every life experience –not just mine but other people’s. How do you choose the traditional songs you sing. Do you have a criteria? I really enjoy story songs and songs which pose questions. William Taylor, which is on my first album ‘Tempvs’ is a fantastic example of both. And then there are songs which endure because they describe a common human experience, like the Salley Gardens which I have been performing for years. A strength of the oral tradition on which folk music relies –songs being passed from person to person – is that songs become crafted and improved over time so that they reflect human nature. In your own compositions, which comes first the words or the music? Most often I start with a musical idea which I cannot express in words –a mood, a feeling or an atmosphere which I want to capture. The words help to make this idea clearer. You have your own record label, how important is artistic control for you? Very! Both the recording and the arranging processes are crucial to the development of each composition and I have deliberately set about writing and arranging my own work. It also really helps set the pace of recording as I am self-reliant -so if I want to work through the night I can. I try not to have regrets. Having said that on, a professional basis, more honesty would have helped me access song writing ideas earlier on in life. But then there’s a reason it took me some time to get to where I am now. 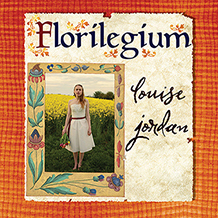 The title of your latest CD is Florilegium, which I am led to believe means a collection of short literary pieces, poems and ballads, how did you arrive at that as a title? The word originally means a gathering of flowers. On the album, each piece has its own beauty and they come together as a bouquet or tapestry. The songs on the album are very individual and yet they fit together as they describe a variety of experiences in life. I don’t have a favourite poet, just favourite pieces. I have enjoyed setting literature –in particular poetry –to music and have done this from a young age. I used to go to a wonderful theatre group for 13-21 yr olds in my home town of Salisbury and this really encouraged creativity. We frequently worked with literature and used music in a less conventional way. I can trace my musical arrangements of Christina Rossetti’s ‘Promises Like Pie-crust’ (on my second album Florilegium) and Thomas Hardy’s ‘Without Ceremony’ to these early experiences. White is a culmination of all the colours and I am an accumulation of my many life experiences. Thanks Louise. She is definitely worth catching live if you get the chance. Clifton Suspension Bridge Saturday. Before you say anything I was driving not taking the photograph (- honest officer), that's why you have so much of the left side of the approach. I thought the bridge, which looks wonderful at anytime, looked rather special in the snow. But today I am focusing on poems. Old ones I have not yet posted. This first one is about the death of my brother in law. It concerns the trip to Wales we made to scatter his ashes and to bury a memory capsule. He was a very active man and had climbed Mont Blanc, I had not realised you get a medal for getting to the top. He is still much missed by me. A road, the lake, other peaks. We all found stones to mark this place. Your life deduced from the objects. Before the mountain itself turned to dust. Will be less than the pain I now feel. This one is older and as I remember based on a conversation I had with a friend about a car boot sale they had been to where the items for sale were all broken or incomplete. I do not think we shared a bottle of cider though. Drizzle, a street lamp halo. Wet, fuzzy hum in head and air. grow in the detritus of the dead. are the best we can scrape together. No one ever wants to buy. if only to shut him up. Damp cars splashed through the night. finishing the cider too soon. In the middle to the late 1990's I participated in a multidisciplinary group supervision process, I was wearing my social worker hat in those days. One of the people talked about a difficult situation they had been in and the discussion inspired the poem. I liked it at the time because the ending was optimistic - very little was then. A quiet violence moves within. (and left her head alone). How it feels to be her. Such contagion we can stop. The fact that we can facilitate change and healing is important to me. In the economic maelstrom of the present government it is more difficult to hang on to this. I am going to end on an upbeat, with a photograph of one of our cats asleep the other evening. May your weekend be as restful as his. I'll be back on Tuesday with an interview with Louise Jordan. The charming and talented singer/songwriter Liz Lawrence played a barnstorming gig at my house last night. She came in from the snow and played a wonderful set of original tunes. I first heard Liz on youtube and was impressed with the OoSong, the catchy tune, her amazing voice and the clever video. I liked the video because, although it was obviously shot on a tight budget, there was a good correlation between image and lyric. The use of the paper boat as a symbol for our hopes and dreams I thought worked well and the shot of the little boat in her coffee cup was an image that stayed with me. Anyway to cut a long story short Liz agreed to play a gig at my house as part of her Sofa Tour to promote her new album. The set was bookended by songs from Bed Room Hero as well a sprinkling of new work. Of the newer songs Rooftops stood out for me, as lyrically it seemed different, more poetic, with arresting images. Liz told me that Rooftops was an indication of the direction her writing was moving towards. She started the set with the Oo Song and I was impressed with the way the song worked equally well in an intimate setting as on the video with a full band backing. She played for about an hour and captivated the audience. Liz has an relaxed manner and delivered her set with passion. You may be lucky enough to catch Liz as she travels the country this month on the Sofa Tour. If you get the opportunity take it. She will be back in the west country in Apriland judging from the reaction of the audience last night, we will all be going to see her. At the moment you can not only hear her new album at Bandcamp but you can also download it and until the end of this month and decide what you want to pay for it. This is a great deal and will finish at the end of the month. After that you’ll have to download it from itunes or buy the tactile cd version. When this is out I’ll be reviewing it and telling you where you can get it. Yes, today it’s snowing, and as you can see from my photo, the bamboo in my garden has wilted under the weight. Today’s title comes from an old Irish song. My favourite version is by Anne Briggs and you can listen to it here. There are many versions of the song, which I think is traditional. Anne has such a beautiful voice, here is a video clip that I may have posted before. As she gave up singing in the 1970’s there’s little footage of her. Today though I do not want to solely sing the praises of a great singer. Before the snow came I was thinking of having a title about reworking/revision, because that is what this post is about. I probably sound like a record with a stuck needle, for all of you old enough to get the vinyl analogy, but revising your work is essential. I’ll give you an example recently I posted a couple of poems that I thought at the time were complete. You can read that version here. I have to thank Chrissy & Liz, the two people in my rather informal poetry group for their help in polishing these poems. What do you think of the changes? The second revised poem was first posted here. This is the latest incarnation of it. Good to go; make sense of it as you will. shapes information, says it out loud. It’s no wonder wars start and lovers turn to haters. As you can see there are differences in the two poems from how I had originally presented them. I think they work better now, do you? The secrets are revision and sharing with sympathetic people. Constructive feedback is as valuable as platinum. Join a group and learn to give as well as to receive. I’ll leave you with a couple more photographs. Have a good week. I have Liz Lawrence playing in my sitting room as part of her sofa tour of England, more about that next week. I thought this week I would post some more haikus as it’s about six months since the last time. Now what will you choose? I want to leave you today with a link to the nice people at Corvus Press UK. Should you wish to, you can follow this link to their website and download a story to your kindle/ebook reader. Even as we eat earth in the grave, there is slow change. Nothing is static. An arresting image. There are those who will tell you that if you want to hook the listener or the reader, then you must do so at the outset, make them want to continue. I am not so sure myself. I think the poet and the writer, needs more than one trick. For me the topic influences form. A poet cannot tackle every idea in the same manner. As the idea spills on to the page it may suggest structure. I was talking about this with a couple of other poets recently and one pointed out that the first line that tumbles on to the page may in fact be the last line, or find its true place in the middle of the poem. The knack, if it can be called that, is to keep working on the poem until it has its own shape. Then put it away for as long as you can. When you look at it again, you may see flaws that escaped you earlier, when you were too close. Sometimes you get it right and they are whole. The skill is knowing when to stop. I once refined one of my poems to the point where, when I showed it to another poet, they described it as a skeleton, the bare bones of a poem. I have to say, I never did anything else with it. I suppose I threw the baby out with the bath water. Another arresting image to end on. I am going to end with a love poem. During the Freeze Frame broadcast I confessed that I rarely write love poetry. I find it very difficult to capture the mood, the emotion, the essence of what I want to say. I fear I will sound like a bad pop song, hackneyed and vacuous. The poem refers to a painting I saw in an exhibition years ago in Barcelona at the Diocese Museum. It is by Georges-Hanna Sabbagh, an artist from the 1920s. I cannot find the painting on line, so you will have to take my word for it. A naked woman sits in a chair, her back is to the bay window, outside it has snowed, we look down on a cityscape, people (and a dog,) walk the snow streets. Inside the woman looks down at her feet, which are on a bright rug. She seems comfortable in her body, lost in her own thoughts, oblivious, or indifferent of the artist. Huddled people hurry through the snow. She rests, Defiant of winter. Directly, into the eye of her beholder. Flick through this art book. The descending curve of your stomach.